Kurz vor der Sommerpause gibt es gute Nachrichten für die Leser und Autoren von Advanced Optical Technologies: Alle Artikel des Jahrgangs 2012 sind jetzt frei verfügbar. Einige Artikel waren gleich nach Publikation freigeschaltet worden, aber jetzt haben sich die Partner De Gruyter Verlag und THOSS Media entschieden, den kompletten Jahrgang auf der website www.degruyter.com/aot für die Optik-Community frei zugänglich zu machen. 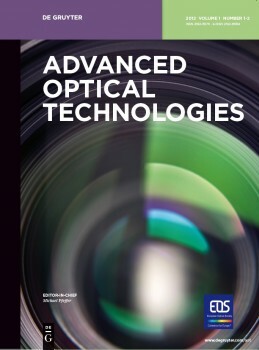 Advanced Optical Technologies is a new journal on Optical Engineering & Manufacturing with an innovative concept addressing the needs of the industrial and scientific optics community. After a successful start in 2012, the journal continued this year with more high quality articles and more topical issues on topics such as Optical Design, Image Sensors and Cameras or Microscopy Technologies. Further topical issues are planned for the following fields: Lighting & Illumination, Optical Materials, Remote Sensing, Optical Coatings, and Active Imaging. All submissions are subject to rigorous double peer reviewing. The journal is now open for submissions from all fields of applied optics. For further information you may read the Call for Papers or the Instructions for authors. For direct questions you are welcome to contact the editorial office directly at contact@advanced-optics.org or th@thoss-media.de.